Cihan Biyikoglu is a Program Manager in SQL Azure covering the programmability surface of SQL Azure. 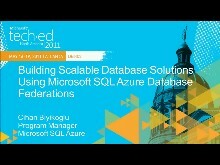 These days, Cihan is focusing on SQL Azure enabling scale-out database solutions through SQL Azure Federations feature. Prior to joining the SQL Azure team, Cihan was the program manager at Microsoft HealthVault platform and SQL Server as part of the SQLCAT team. Earlier, Cihan also worked on database technologies including Illustra and Informix Dynamic Server at Informix. Cihan Biyikoglu has a Master's degree in database systems from University of Westminster in the UK and a Computer Engineering degree from Yildiz Technical University in Turkey.